This is the tale of two cows; with a little twist. 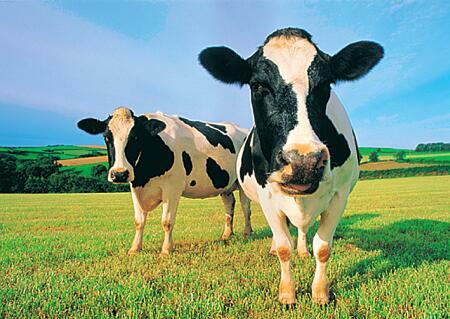 In a certain country farm there were born two cows Molly and Holly. Both were identical twins with features so same that it was impossible to tell them apart. But when it came to behaviour, both were totally different. Molly was brave, adventurous, outspoken and always the bright spark. In contrast Holly was just your normal shy and average cow. Because of her nature, Molly was everyone’s favourite. While all the people and animals in the farm adored Molly, they did not pay any special attention to poor Holly. People often compared them both, with Molly most of the time scoring high in compliments and praises. The constant comparison with her sibling left poor Holly often in tears and she grew up with a deep and lingering inferiority complex. Molly immediately perked up. “Do you really think so Steve?”, she asked. “Hmm … I don’t know. The farm is safe and comfy”, Molly replied hesitatingly. “C’mon girl! Ask yourself!! With a personality as yours do you really want to be cooped up your entire life in this barn? Think about it!”, Steve said. And saying so he walked off. Molly thought long and hard the next few days. She tried to envisage the pros and cons. Life on the farm was comfortable no doubt. There was regular food and caring. But it was also stationary. There was nothing new or exciting about it. It was the same old boring routine everyday and it would be the same old routine her entire life if she decided to stay here. On the other hand, life in the city offered various choices. True, it was unknown and dangerous territory. There were various pitfalls and traps out there. But there were also so many things to do. She could learn new things, meet new people, visit various places, earn money and make a new life out of herself. Life in the city, while dangerous was also exciting and full of adventure. Finally, after a lot of deliberating, she made her decision. Holly looked up to her in between chewing, a puzzled expression on her face. “Umm…. Well I think it’s pretty Ok.”, Holly replied. “Of course, you think so! You just don’t have any taste for adventure.” Molly snorted. Holly blushed, stung by the rebuke and continued chewing hay. “Uh-huh.”, Holly said, in between chews. “So what do you plan to do?”, she asked. “You WHAT ??!! !”, Holly exclaimed dropping they bundle of hay she was chewing. “Shhh … not so loud! Do you want to alert the entire farm?”, Molly said. “Hmm … of yeah, Sorry! Are you serious?”, Holly replied. “Of course I am girl! I’ve never been so serious in my life. There are a thousand things to do out in the city. I’ll find a job, earn lots of money and become rich and famous! Come with me. You can be my right hoof…. So to speak. Don’t get cooped up your entire life in this wretched farm. Just think of the possibilities. We can have nice gourmet food instead of the dull hay we eat every day. We can drive around in expensive chauffeur driven cars instead of lugging carts. We can go places! !”, Molly replied enthusiastically. But Holly did not share her sister’s enthusiasm. “Uh-oh! Count me out! I think the best place for me is the farm!” she said. Her reply piqued Molly considerably. “I knew you would say that!”, she snorted. “Well! A cow you are and a cow you will be forever! Stay here and waste your life! Just do me a favour and don’t breathe a word about this to anyone.”, Molly said and walked away in a huff. Holly, who was by now accustomed to such abuse from Molly sadly shook her head and continued munching hay. That night Molly secretly ran off to the city. The farm hands were perplexed by her disappearance and searched high and low in and around the farm, but in vain. Soon, they forgot about her and life went on as usual. Molly had to face a lot of struggles in the city initially. She was homeless with no money and had very few friends. But she had spirit and soon landed up a job with a big corporate dairy firm. She worked hard night and day and came to the notice of the owner who promoted her, gave her a good raise and additional responsibilities. Her confidence grew along with her ambition and she started working doubly hard. But in the process, she lost all her friends who now feared her as she had more power. Day by Day, Molly got more and more immersed in work. She worked hard, she worked smart and brought herself into notice of her superiors. Slowly and steadily, she climbed up the corporate ladder. Soon, she became an indispensable asset to the company and rose to great power and ranks. But all this came at a price. Her colleagues feared and despised her, became jealous of her power and position and started hating her more than ever. Molly’s continued hard work coupled with an irregular lifestyle also began to take it’s toll on her health. She frequently fell ill and slowly and steadily her health condition deteriorated. This continued for some-time until her system could take it no more. One fine morning, her heart gave way and she collapsed and died on her work place. The irony was that the company people for whom she dedicated her life and worked so hard for, were not even the least affected. There were no tears shed on her demise. Many had wanted to see her go. With shocking disdain, they just dumped her body outside the company premises and went about their daily business as if nothing happened. Outside, vultures, hyenas and other scavengers were waiting. They attacked tore apart poor Molly’s body limb by limb and feasted on her flesh till there was nothing left of her, not even bones! On the other hand, Holly was now the centre of attention now that Molly was gone. But her experiences of the early days always kept her humbled and grounded to earth. She had her priorities set early in life and did not carry heavy expectations and was well aware of her responsibilities. She grew up to be a fine and sturdy cow on the farm and gave lots and lots of milk of good quality. Slowly and steadily, she became an indispensable asset to the farm. She also gave birth to fine and healthy calf specimens much to her owners delight. Though she did not have any extra-ordinary talents and did not win any medals, she was well versed with her strengths and limitations and more importantly, was very comfortable with her identity. She was well treated and likewise, she treated all animals on the farm with respect. She lived a happy cow for the rest of her life and also died peaceful and content, knowing that she had done her duty well and lived a fulfilling life. So which cow do you want to be?